This 1954 American drama film was written by Michael Wilson, directed by Herbert J. Biberman and produced by Paul Jarrico. All had been blacklisted due to their alleged involvement in communist politics. The film was one of the first U.S. films to advance the feminist social and political point of view. Its plot centres on the long and difficult strike against the Empire Zinc Company in Grant County, New Mexico. Guest speaker is Phil Chamberlain, co-author of Blacklisted: The secret war between big business and union activists. Phil Chamberlain is an experienced investigative journalist who has written for the Guardian, Observer and the Independent amongst others. He is also a senior lecturer in journalism at the University of the West of England, Bristol. Based on an actual strike against the Empire Zinc Mine in New Mexico, the film deals with the prejudice against the Mexican-American workers, who strike for fair treatment and equity in wages with Anglo workers. Ramon Quintero (Juan Chacon) helps organise the strike but at home he treats his wife as a second-class citizen. His wife, Esperanza Quintero, pregnant with their third child, is passive at first and reluctant either to take part in the strike or to assert her rights for equality at home. She changes her attitude when the men are forced to end their picketing by a Taft-Hartley Act injunction. 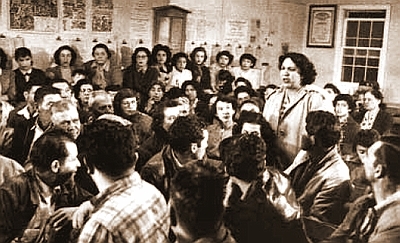 At the union hall, the women convince the men, after a long debate, that they should be allowed to participate and they join the picket line. The film was called subversive and blacklisted because the International Union of Mine, Mill and Smelter Workers sponsored it and many blacklisted Hollywood professionals helped produce it. The union had been expelled from the CIO in 1950 for its alleged communist-dominated leadership. The film was denounced by the United States House of Representatives for its communist sympathies, and the FBI investigated the film’s financing. TheAmerican Legion called for a nation-wide boycott of the film. Film-processing labs were told not to work on Salt of the Earth and unionized projectionists were instructed not to show it. After its opening night in New York City, the film languished for 10 years because all but 12 theaters in the country refused to screen it. Thanks to wikipedia for the bulk of this text.